I made a meal for a friend today and came across a new cookie recipe I had to try. I love trying new recipes but… I LOVE trying new desserts! These cookies turned out super soft and chewy. My kiddos loved them too! Grab a glass of cold milk and you’ve got the perfect after school snack! Preheat oven to 350 degrees F. Line a large baking sheet with parchment paper and set aside. In a large bowl, whisk flour, cornstarch, baking soda and a salt together. Set aside. In the bowl of a stand mixer, cream together butter and sugars until smooth and creamy, about 3 minutes. Add egg and vanilla extract and beat until combined. 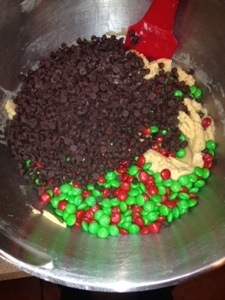 Slowly mix in the dry ingredients. 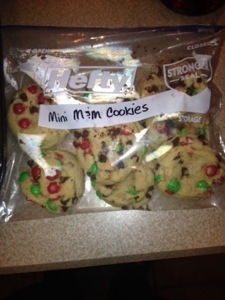 and mini chocolate chips. 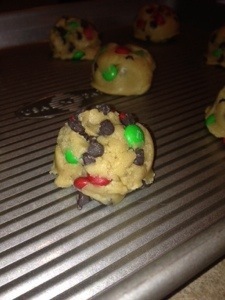 Form cookie dough into teaspoon balls and place on prepared baking sheet, about 1 inch apart. Bake cookies for 8 minutes, or until slightly golden brown around the edges. Let the cookies cool on the baking sheet for two minutes. Transfer to a wire cooling rack and cool completely. 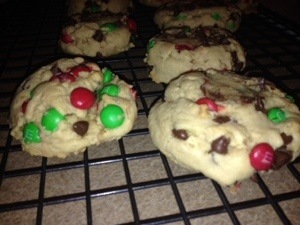 To bake: Pull out the desired amount of balls and place on a greased cookie sheet for 30-45 minutes to thaw. Bake at 375 degrees for 10 minutes or until done. Makes approximately 40 cookies. 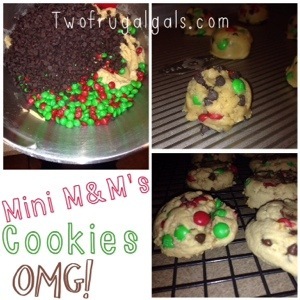 Also, check out our other cookie recipes below!